Mick Larrabee PT, Knoxville, TN | Optimal Performance Inc.
Mick combines his knowledge of the rehab sciences with the principles of strength & conditioning to create a program that not only maximizes athletic performance but minimizes the risk of injury. 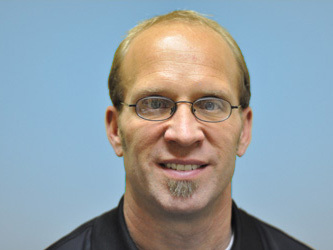 He is board certified as a clinical specialist in sports physical therapy and currently treats a variety of orthopedic patients in a 2,000 sq ft sports training facility (sharing space with M6 Strength & Conditioning). OPI is the company that Mick co-founded to provide performance enhancement services and injury management services to the multi-sport athlete. Mick’s professional focus is on lower quarter biomechanics and functional training to take movement and create performance. He is a firm believer that it’s not a matter of training harder ... rather you must train smarter! Mick is a featured columnist in Footnotes Magazine (award winning publication of the Knoxville Track Club) and has also been published recently in Triathlete Magazine, Men’s Health: Muscle, as well as Tennessee Running. He can be seen delivering presentations to various groups regarding performance enhancement &/or injury prevention. In addition, Mick serves on the Board of Directors for the Knoxville Track Club and acts as a consultant to several local organizations including: Greater Knoxville Triathlon Club, Smoky Mountain Athletic Club, Runners Market, New Balance Knoxville, and the University of Tennessee Rugby Team ... among many other amateur and professional athletes. Mick currently resides in Knoxville, TN with his wife Holly, three boys (Tyler, Ryan, and Dylan). José "Tony" Parrilla enjoyed a world-class track and field career at both the University of Tennessee and in international competition. He won four NCAA 800 titles, more than any other collegian. He was a 10-time All-America, and Tony holds Tennessee’s school record of 1:43.97 in the 800. Parrilla competed for the U.S. team in the 1992 and ‘96 Olympics. Tony earned a B.S. in human motor behavior from the University of Tennessee and holds certifications in myofascial integrative technique, active isolated stretching and is currently studying myoskeletal alignment techniques. He has worked as an exercise physiologist, fitness instructor and personal trainer. Tony has regular office hours for massage therapy clients at Eddie's Health Shoppe.